Two organic milk companies dominate the industry by relying on lax federal standards. Some local producers, however, are doing it right. Questionable pasture at a Dean Foods lot in New Mexico. The organic dairy industry has fallen on rough financial times in the past year. Small farmers have been especially hard hit, as the recession prompts price-conscious consumers to buy cheaper alternatives. Yet despite the severe downturn, two giants of the organic milk industry are going strong. And the secret to their success appears to be a loophole in federal law that lets them market their milk as "organic" while raising their herds in a manner that critics say mocks the term. Two companies have come to dominate the world of organic milk in recent years: Dean Foods, which owns the Horizon brand, and Aurora Organic Dairy, which provides milk to major retailers who then convert it to house brands. For example, if you buy organic milk marketed as Safeway Organics, it's actually produced by Aurora. The Colorado-based company also supplies so-called "private-label" organic milk for Wal-Mart, Costco, and Trader Joe's. 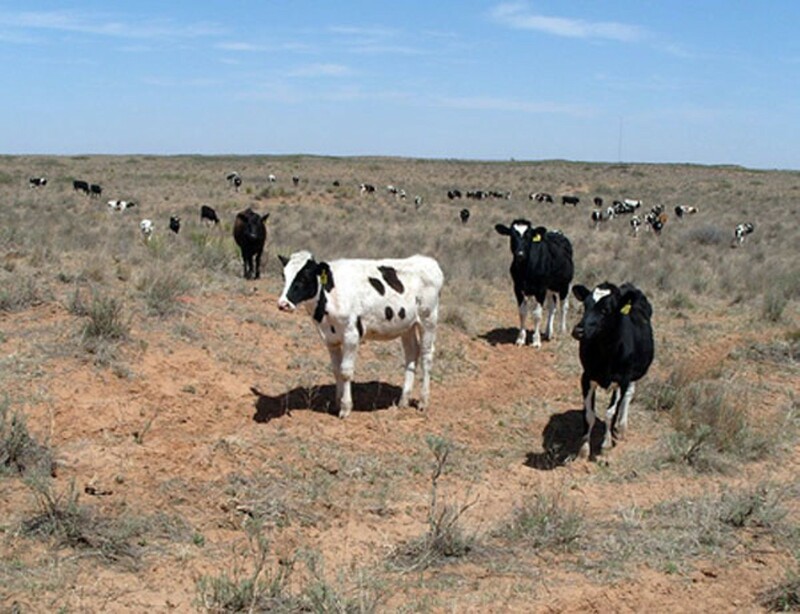 Dean and Aurora continue to gain market share in part because lax federal organic standards allow them to operate or contract with massive farms that maintain dense herds of cattle. Aurora operates five big milk-producing farms in Colorado and Texas. By the company's own count, the farms range in size from 630 heads of cattle to 5,250. Dean Foods, which also owns Berkeley Farms of Hayward, contracts with at least ten privately owned farms with more than 1,000 cows each. 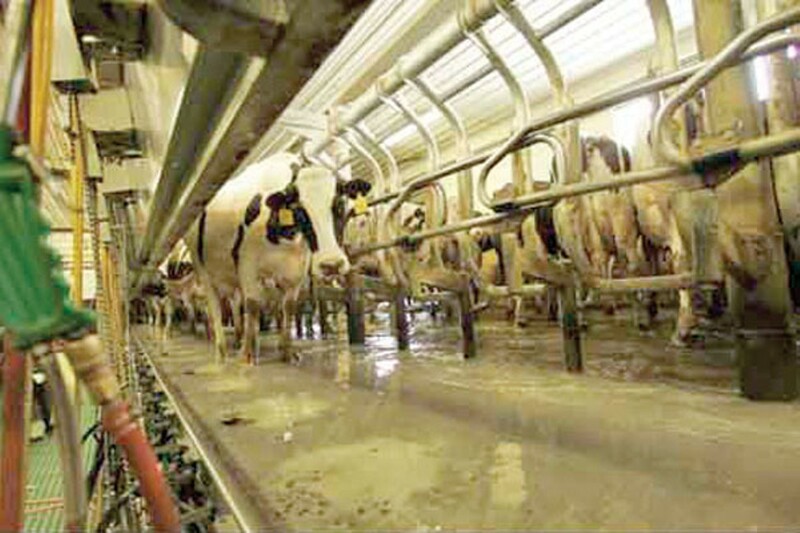 Some environmentalists contend that huge operations are nothing more than factory farms, where cows are crowded into tight confines, and then milked to death as they stand in their own feces. Critics also say these relationships enable Aurora and Dean Foods to undercut the prices of smaller milk producers who own or contract with farms that provide ample grazing room for their cows and are stewards of the environment. "The smaller farms just can't compete," said Mark Kastel of the Wisconsin-based Cornucopia Institute, a leading environmental advocacy group and watchdog in the organic industry. "They're having to compete on an unlevel playing field." Kastel and other critics also contend that it's not just their massive size that gives Horizon and Aurora a big edge, but also how they practice their "organic" farming. The companies appear to be taking advantage of a federal standard that only requires farmers to provide their cows "access to pasture." This standard, critics argue, has allowed large companies to herd milk cows onto giant feedlots where they're given organic feed. The well-fed cows are later provided "access to pasture," but it's essentially meaningless because they've already eaten. And because the cows don't actually rely on the pastures for food, they can be kept in unsustainably crowded conditions. They also are often milked three times a day, instead of two, in order to extract as much milk as possible. "What you have is giant feedlots of thousands of cows that are overly milked and then die young from stressed-out lives," Kastel said. In an interview, Aurora spokeswoman Sonja Tuitele maintained that her company's ownership and operation of its own farms — and not the size or practices of those farms — have allowed it to weather the economic downturn. The privately held company has posted relatively flat sales compared to last year, she said. But that performance has come at a time when smaller organic milk companies have experienced significant losses or exited the business entirely. Sara Loveday, a spokeswoman for WhiteWave-Morningstar, a division of Dean Foods that includes Horizon organic milk, Silk soy milk, and Land O Lakes butter, credited the "diversity" of her company's operations for keeping it financially healthy. And healthy it is. In the company's latest quarterly report filed recently with the US Securities and Exchange Commission, it boasts that "Horizon Organic outperformed the overall category with an increase in market share." Horizon already was the biggest player in the organic milk industry before the recession started. Both spokeswomen also made a point of saying that their companies and suppliers abide by federal law. But there's no denying that both dairies have experienced some substantial embarrassments in the recent past. For example, in 2007, the US Department of Agriculture revoked the organic certification on a 10,000-cow farm in California's Central Valley that supplied milk to Dean Foods because it wasn't providing access to pasture at all. That same year, USDA staffers recommended that a massive Aurora-owned dairy in Colorado lose its organic certification as well. But then a top Bush Administration appointee overruled the recomendation and gave the company what amounted to a slap on the wrist — one year of probation — after it agreed to change its practices. Both companies also have been sued repeatedly by small farmers and consumers because of their business practices. And some organic advocates are urging the USDA to change its organic rules to require that cows actually have to graze at least 120 days a year so that producers who don't honor this standard won't have such a huge advantage over those who do. Aurora spokeswoman Tuitele said her company now grazes its cows at least 120 days a year on all of its farms, and that most cows are now milked only twice a day. However, in late August the Cornucopia Institute filed an official complaint with the USDA, alleging that the grazing practices at Aurora's High Plains Dairy in Colorado still flout the intent of federal organic laws. For starters, the organization says it has evidence that the High Plains Dairy is providing its cows with pasture that is unsuitable for grazing. It also contends that even if the company were supplying its herd with nutritious crops to graze on, such as alfalfa, the huge numbers of cows would quickly overrun it. According to Aurora, the dairy provides its 3,690 cows with just 660 acres of grazing land, which works out to about six cows per acre. By contrast, the accepted standard for ensuring that a pasture remains sustainable is two cows per acre. In its complaint, Cornucopia contends that Aurora's lack of pastureland coupled with the large size of its herd makes "meaningful grazing, even if appropriate crops were available, a dubious proposition." So what should consumers do? Well, there are plenty of alternatives to Horizon and the house organic brands at Safeway, Trader Joe's, and Costco. One exemplary Bay Area milk supplier is Clover-Stornetta of Petaluma. The family-owned company operates a cooperative with small North Bay organic farms that employ sustainable farming practices. "Our philosophy is that cows should have continuous access to pasture and they should get nutrients from that pasture," explained Clover-Stornetta President Marcus Benedetti. Eco Watch recently visited one of Clover-Stornetta's longtime organic milk suppliers — the Triple C Ranch on the outskirts of Petaluma. Owner Bob Camozzi said he grazes about 400 milk cows on 920 acres of land, which works out to about one cow for every two acres. In other words, Camozzi's cows get twelve times as much space as Aurora's. Camozzi, however, is not one to brag about his methods or criticize others. "I don't want to point fingers," he said. "But I do think people should be educated." His cows spend most of their time during the spring growing season grazing on the far reaches of his sprawling acreage. And he said he never milks the cows more than twice a day — once in the morning, before they go out to graze, and then again in the late afternoon, when they return. "If you push a cow, she doesn't last very long," Camozzi explained. "And if you don't milk them as much, they last a long time." Clover-Stornetta is available at most independent grocers, including Berkeley Bowl and Farmer Joe's in Oakland. In addition, Whole Foods' California stores have replaced Horizon with Clover-Stornetta. And if organic milk is too expensive for you, Clover-Stornetta's traditional milk also comes from small farms that practice sustainable farming, don't use hormones, and ensure that their cows graze on viable pastureland. On its web site, Cornucopia rates organic milk and dairies throughout the nation. It gives Clover-Stornetta a four-cow rating, with five being the highest possible. Straus Family Creamery in Marshall, near Point Reyes, also received a four-cow rating. By contrast, both Aurora and Dean Foods' Horizon milk received zeroes after refusing to partake in the survey. Dean Foods also came under fire this year when it changed its popular soy milk brand — Silk — from organic to "natural," without altering the traditional packaging. The term "natural" has little meaning under federal law in terms of soy milk. In fact, Dean Foods admits that it's new "natural" Silk product comes from soybeans sprayed with insecticides and pesticides. Not surprisingly, consumer groups immediately accused the company of trying to dupe consumers in order to maximize profits, noting that the new "natural" line was still more expensive than traditional non-organic soy milk. "It was sneaky," said Kastel of the Cornucopia Institute. "It's representative of what's going on." Company spokeswoman Loveday said they informed their largest customers of the change, as well as their major suppliers. Dean Foods later altered the packaging to make the switchover to "natural" more apparent and introduced a separate line of Silk organic milk with new packaging as well. Overall, Silk owns about 70 percent of the national soy milk market. Loveday said the company was not trying take advantage of consumer confusion over organic and "natural." Nonetheless, a study last year showed that tricking consumers is pretty easy. The study revealed that most shoppers think "organic" is just a fancy way of saying "expensive" and don't realize that it's regulated by the federal government. By contrast, they think "natural" is regulated, when it's really not. The study, by the Shelton Group, a Texas-based marketing firm, found that 57 percent of consumers thought foods labeled with "100 percent natural" or "all natural ingredients" meant that they were superior. Only 26 percent thought the same about food labeled with "100 percent organic" or "certified organic ingredients." Although it's not local, Eden Foods makes an excellent organic soy alternative to Silk. Cornucopia gives the Michigan-based company its highest rating — five beans. The consumer's group also gives four beans — the second best rating — to Whole Soy of San Francisco, which makes soy yogurt and soy frozen yogurt.